If you’re a wargamer in the UK it probably hasn’t escaped your attention that the BBC’s old show Time Commanders has returned to the small screen. Episode one aired on 12 Dec with the Romans vs the Carthaginians at Zama. For those unfamiliar with the show it pits two teams of three against each other in an ancient or medieval battle. The actual fighting uses a modified version of the Total War engine. The show provides several keyboard monkeys to do the button clicking, with the contestants in the role of commanders (one overall general and two captains). The show aims to educate, with two military historians covering actual weapons and tactics, and critiquing the actions of the players during the battle. So it’s both a study of the historical facts of an ancient battle, alongside the timeless human psychology of command. Perhaps one of the most commented-on changes was the new front man for the show: TV foodie Gregg Wallace. I heard a fair bit of scepticism about him commanding a historical wargaming show, but do you know what? I thought he was pretty good. He was clearly enjoying every minute of it, and his energy made a good balance to the dry observations of the two experts. During the between-battle sections he asked some very good, relevant questions, and seemed to have a pretty good grasp of what was going on and what the players should be doing. In fact if I was going to criticise anything about him it was that at times he overstepped his role as a presenter and directly advised the players, particularly when he thought they were making a mistake. But whenever he did this, he was spot on with his advice, so he’s certainly up to the job. Original Nusbacher left, new Nusbacher right. There are some familiar faces back on the show. The ubiquitous Mike Loades was back, and doing his usual thing. 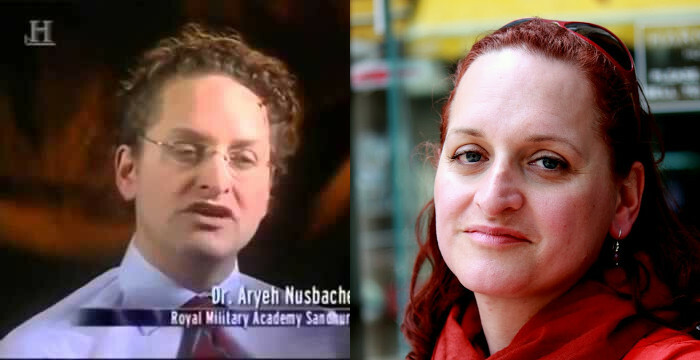 Also back is Sandhurst’s Dr Nusbacher, sporting a new pair of breasts and a name change from Aryeh to Lynette. He was always mildly annoying, and her new higher pitch really doesn’t do anything good for such a nasal voice. In terms of content though, her observations are accurate and do contribute to the show. The show retains some of the format tweaks from the second series; the most significant are the small skirmish battle that’s fought before the main one, and the ability for players to call a time out. The skirmish battle does a good job of blooding the commanders before the main event, although it can also lead them astray. One of the generals in the first show tried to emulate his successful ambush tactics used in the skirmish even though his mission had changed for the big battle, and it cost him dearly. The use of a time out is a bit controversial in my opinion. The main thing that causes players to lose the game is when communication breaks down under pressure, and when commanders aren’t able to think on their feet. Being able to pull the handle and pause the game allows them to escape this trap, and they’ll get an injection of perspective and advice from the experts. This does allow the rookie commanders to get out of trouble, but I guess the skill is in recognising the right time to use your time out. In episode one the Carthaginian commander made excellent use of his and saved his force from getting totally stomped, while his opponent squandered his at a relatively unimportant point in the fighting. Having said that, the Romans eventually went on to win, but it would have been much, much more one-sided without the time outs. Overall, a lot of the focus in the format is on easing the learning curve for the players, which is probably fair, because I recall seeing some pretty woeful performances under pressure in the first series. I enjoyed the show, and it does a good job of both showcasing a real battle and touching on some of the weapons and tactics of the men who fought, as well as the wider strategic context. The actual fighting is a really interesting study in how people think and communicate under pressure (or more, how they don’t!). This where a game like Time Commanders rises above its PC-game roots, making players work as a team introduces interesting dynamics of communication and situational awareness, while having a human opponent can allow a psychological factor between generals, with the ability to seize the initiative from your opponent. Unfortunately the influence of time outs means that a general who finds they’ve lost the initiative can simply put the hand brake on and reset, but that’s probably an acceptable compromise that prevents massive walkovers that are probably less entertaining for the TV audience. Very interesting, I will try to get a look. My main issue with the programme was the real lack of showing what was going on in the battle. The editing on this aspect I thought was really poor, and made it very hard to follow the detail of the battle. Footage from the battle often being shown out of sequence. Probably too much time was given over to looking at Gregg Wallace reacting to things, though I do think his enthusiasm was definitely a good thing and he clearly knew what it was all about. Fair point, I too found that it was sometimes difficult to follow what was happening in the battle. Conveying everything that’s going on a dynamic environment like that is tricky though, as they’ve got to cover both the virtual action in the simulation, and the real action between the players. That’s a very balanced and thoughtful review Andy, spot on really.